24 new entries added to super bowl slogans, that include pictures. 1. The Only Sunday that Matters! 1 The Only Sunday that Matters! 2 Sundays are for Eagles! 3 Sundays are for Pats! 4 Are You Ready for Some Football? 7 Come for the football, stay for the snacks! 10 The Bowl of the Bold North! 11 Free For All Super Bowl LII! 13 First downs to Touchdowns That's How We Roll! 15 I'm just here for the commercials! 16 I will not calm down when the Eagles are on! 17 I may not be perfect, but at least I'm not a Patriots fan! 18 Super Bowl - Get Ready. 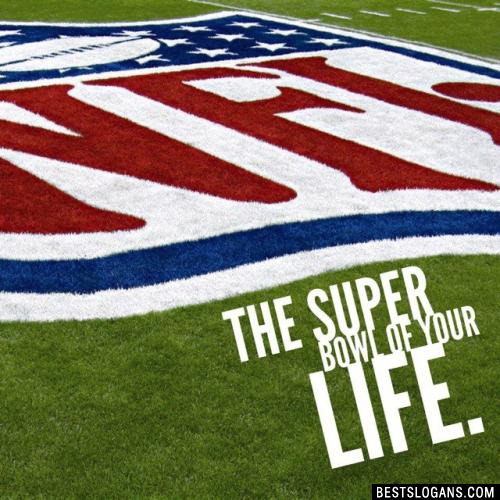 The Super Bowl Of Your Life. 20 Think, Feel, Super Bowl. Can you think of a good Super Bowl Slogans we're missing? Or come up with a clever one of your own. Please share below.